As we have welcomed in a new year it is now the perfect time to make some resolutions, have a de-clutter and get organised so I’ve started with Evangeline’s bedroom. This room is one of my favourites in our house, we moved in just one month before she was due and I had everything waiting for her when we finally brought her home from the hospital. I seemed to forget that she wouldn’t actually be sleeping in there until she was at least six months old. Her bedroom became a dumping ground for things of hers that needed sorting out and it was easily done due to the fact that she wasn’t actually using the room herself. Our biggest plan for the new year was to get Eve finally sleeping in her own bedroom as she was coming up to seven months old. She’s nearly been in her room for two weeks, it was a difficult change for me and I’m still waking up multiple times a night to check and see if she’s breathing. Although we have a gap next to our bed she’s taken to it so well and has slept a lot better in her own space! 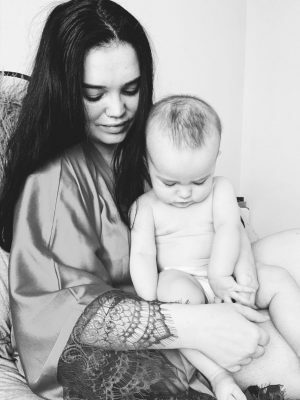 Belo and Me are a UK based brand created by fellow Mum Rachel MacGregor, the products are created for babies and small children and the brand strives to make life easier for parents and parents-to-be. They design and create a range of beautifully designed products from milestone cards, stationery and products for wardrobe organisation. I was fortunate enough to have the opportunity to collaborate with the brand and to try out some of their products for myself and they’ve helped to make Evangeline’s room so much more organised. The package came just before Christmas and felt like a lovely little treat amongst all of the craziness! 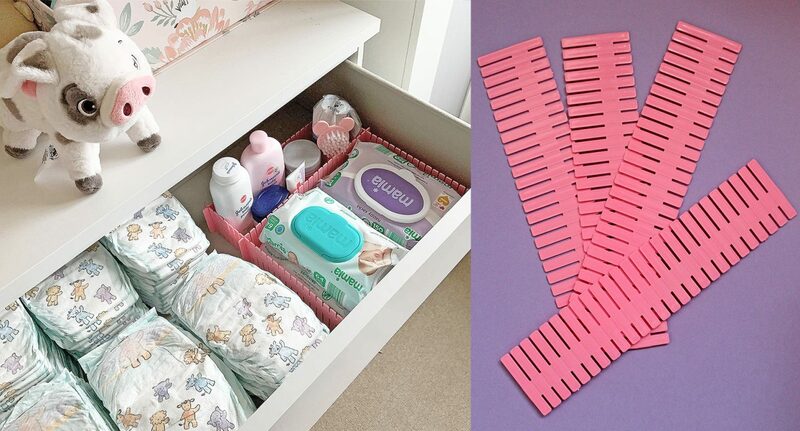 One of the products that I love are the Baby Drawer Dividers, they are so versatile and come in two colours either pink or blue. They are made from a strong plastic but can easily be trimmed and cut down to the desired length. These are so useful to organise a number of things, I’ve used some in Evangeline’s top drawer where we keep all of her nappies, wipes and toiletries. Another place that I found them so helpful were dividing her tights and socks in her drawer, I love being able to easily see what she has clean when putting her outfits together. We were also sent a packet of the Wardrobe Space Savers, these are fantastic if you are limited to space and especially if you have a single rail tall wardrobe. There are so many ways you can organise products, you could hang matching tops and bottoms or clothing sets, you could also bulk hang vests too. Although these products are intended for babies/children they could be useful for in any wardrobe or drawers. I’m definitely going to order some Drawer Dividers for my makeup collection and some Space Savers to create a little bit more room in our wardrobe as Paul and I currently share one whilst Evangeline has two! The one thing that I’ve always managed to keep in order are Evangeline’s wardrobes, mainly because they were extremely easy to fill. I’m very particular about separating her wardrobes into sections and having matching coathangers too, when we move to the next clothes size I rehang everything on her white hangers. We use one of her wardrobes for the current clothes size that fits her and we store everything else in the other one. She has been very fortunate and spoilt since before she was born and after Christmas we are inundated with even more beautiful clothes for her to grow into! Although she’s seven months old she’s still a little dot and I forced her into her 3-6 month clothes just after she turned 6 months old. We have a lot of clothes stored for her as we asked people to buy the next size up when they were were present shopping for her. My favourite item from Belo and Me were the Baby Wardrobe Dividers, we were given the “Sweet Dreams” set. The designs are so gorgeous and the quality of the dividers was a lot sturdier than I had expected. They are double sided and easy to use and read wherever your wardrobe is! The sets range from tiny baby to 18-24 months and would be amazing for expectant parents. Along with a range of designs of dividers they also make a customisable set that you can write your own labels on. These have been amazing in Evangeline’s wardrobe and have made it so easy to seperate her garments from vests to dresses to sleepsuits. If you’re struggling for space you can even write different categories on either side as they are double sided, these would be great if you had more than one child and were storing all of their clothes in a wardrobe together. I was so impressed with this parcel of goodies and will definitely be purchasing some more pieces from Belo and Me in the future. There are so many products to have a look at on the website and they even have gift sets made up of multiple items at amazing prices. A lot of their products are still on sale so grab a bargain while you can! To make January a little bit more exciting I’ve decided to launch a giveaway on my Instagram for the set of the ‘Sweet Dreams’ Wardrobe Dividers. They would be a lovely treat if you’re an expectant parent or if you have a loved one with a baby on the way. It will be running until the end of January so if you’re interested click here to enter! This post contains gifted items. For more information please head over to my About & Contact page to read my disclosure statement.